Dec 30, 2016 (LBO) – Sri Lankan business personalities met Finance Minister Ravi Karunanayake at an intimate dinner event in Colombo recently organized by the Horton Debate Society. 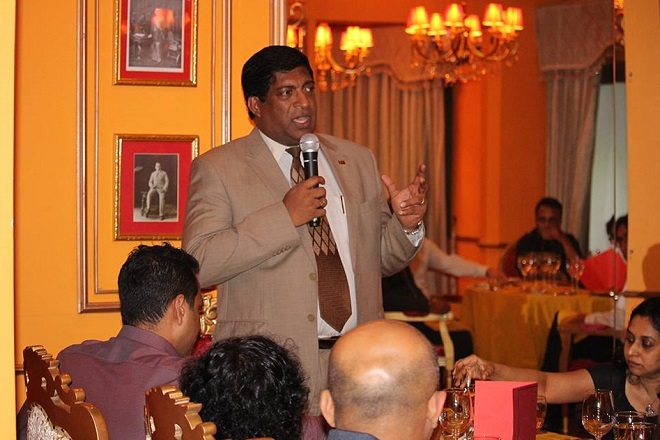 Minister Karunanayake explained the economic policies of the government, at the post-budget event, while members of the networking group were able to discuss some of the proposals with him. Ranjan Hulugalle, chairman of the society, presided over the event, with Dinal Peiris, Prashan Nagendra, Aelian Gunawardene, Tharaka Balasuriya M.P., Anosha Subasinghe and Vinod Hirdaramani among the guests. Attendees discussed several proposals including taxes that will affect the fund industry, and international investments in the country. The Horton Debate Society has held 17 events this year, with movers and shakers on the international stage, providing the opportunity for Sri Lankans to interact with decision makers. JAT Holdings, Sri Lanka’s top furnishing and finishing company, is the sponsor for the Horton Debate Society events. Leaders such as Prime Minister Ranil Wickremesinghe, former New Zealand Prime Minister John Key, and former British Prime Minister Tony Blair, as well as foreign ambassadors and high commissioners to Sri Lanka from India, China, United States, Germany, United Kingdom and Japan have spoken candidly at the off-the-record events this year. Lord Mark Malloch Brown, ranked among Time magazine’s 100 most influential people, Algerian investor Issad Rebrab, ninth on the Forbes Africa billionaire list, and Harvard economist Ricardo Hausmann were among the guest speakers this year. Top corporates DFCC Bank, Expolanka, JAT Holdings, MillenniumIT, and Cake Labs are some of the companies which benefit from the HR and networking opportunities provided by the Horton Debate Society. The society can be contacted at invitation@hortondebate.com.